To sustain engineered organs, the ability to generate vascular systems similar to parts of the body's own circulation will be critical. Synthetic vascular networks that mimic those in living things can now be engineered in a laboratory. Researchers are reporting significant progress in generating a 3-dimensional network of blood vessels that can be grown and manipulated in a laboratory. Building vascular support for stem-cell repaired tissues or replacement organs will be vital to such regenerative therapies. 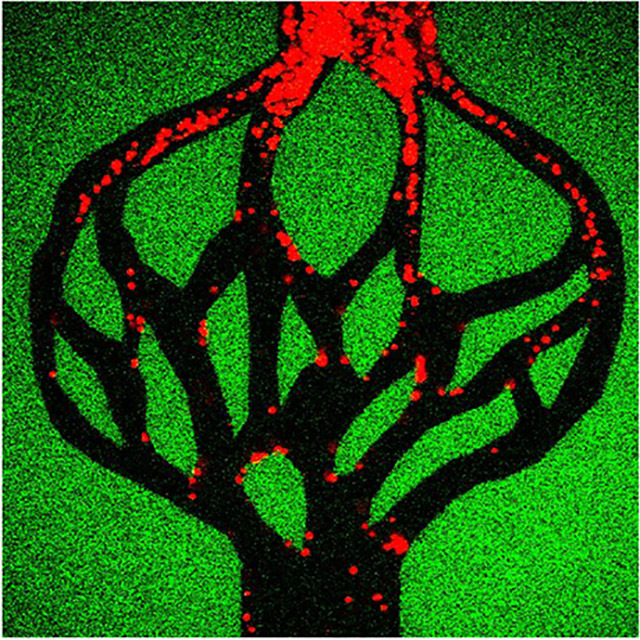 In a scientific paper published today in Advanced Materials, Cole A. DeForest and his team discuss several advances in creating synthetic vascular networks. DeForest is an assistant professor of chemical engineering at the University of Washington and a member of UW Medicine’s Institute for Stem Cell & Regenerative Medicine in Seattle. Blood vessels sustain organ function. The vascular system contains a vast transport complex of larger veins and arteries and smaller capillaries. While researchers have made great strides in creating replacement organs and tissues, challenges remain in making networks of microvessels that can function within and alongside them. DeForest explained how the researchers generated 3D synthetic microvessels using biomaterials that can be manipulated with pulsed laser light. "Though vascular networks are required to support the metabolic demands of almost every tissue in the body, specifying vascularity within engineered tissues has proven exceptionally challenging,” said DeForest. “In this work, we have taken important steps in this regard by creating 3D multicellular vascularized tissues through material photodegradation." The manufactured vessels do not damage living cells, and can evolve over time. They can mimic existing vascular networks and grow within developing tissue. The vascular networks DeForest and his team are building will serve two major purposes. They will provide new methods for studying vascular disease and will advance the engineering of functional biological tissue for transplantation. This work was supported by a University of Washington Faculty Startup Grant, a National Science Foundation CAREER Award, a University of Washington Bioengineering Cardiovascular Training Grant, and grants from the National Institutes of Health. This news item was written by Barbara Rodriguez.